I’ll admit, I’m probably the last person to learn about Geographer and cannot figure out how that happened. The San Fran trio sculpts transcendant, synth winding tracks with disturbingly precise beats and a guitar to keep the sound from feeling completely artificial. 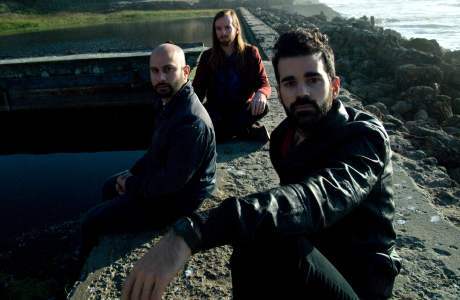 The indie electropop group released their debut album, Innocent Ghosts, in 2008, a heavily praised EP, Animal Shapes, in 2010, and their sophomore album, Myth, on February 28, 2012. Myth is a smooth, fully connected atmospheric record with a simplicity of sound that belies the complexity of the arrangements. Each track maintains a consistent electronic tone that seems to weave through the background, creating a base layer that adds a fullness to the album. Life of Crime has a warped, pulsating sound that could be the soundtrack for Alice’s journey through Wonderland. The pulsation does not relent, but takes a back seat to Mike Deni’s echoed vocals which ably combines a sense of coldness and despair. Blinders scares me. The track starts like any basic synth pop song, but about 40 seconds in, an ominous guitar riff and eerie synth drone bursts into the track and in contrast to the intro, creates a darkness that can only be a representation of the fear that accompanies a visual or emotional blindness. Lover’s Game is the fifth track on Myth and provides an upbeat break to the album. The percussion has a clap-with-the-beat appeal, the electronics have a higher pitch and the lyrics along with their delivery provide an easy access to the song for the casual listener (not in a bad way). The soft vocals and dark electronics have a voyeuristic appeal that makes this album the perfect companion for the things we do when no one’s watching.